Our hair salon is focused on achieving the latest and best hair styles to suit our clients’ needs. We use Color Design, as well as, AG hair care products. 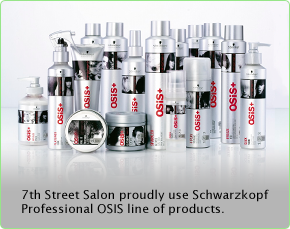 Our focus is to provide our clients with the best in hair care. Whether your desire is for soft bouncy curls, smooth and shiny hair, or voluminous body, 7th Street Salon will give you the results you desire. Call today to schedule your appointment with one off our experienced stylist.